I was recently sent face products from the company called Natura Veda. Natura Veda is different than other products because it includes the ingredient called Moringa. I never heard of Moringa before but I read about it after receiving the products and found that Moringa was just hailed as the “IT Ingredient from Vogue Magazine. Its full of vitamins, nutrients, antioxidants, anti inflammatories and neutraceuticals. I received The Gentle Foaming Facial Cleanser, Trace Mineral Hydrating Mist, Age Defiance daily moisturizer, Age Defense Eye Serum for Night Time and Age Defiance Revitalizing Night Cream. I found the products to be very gentle and moisturizing.I really liked the daily cream under my makeup and liked the night cream as well. None of the products burned my eyes like I find with many products. I felt like they left a nice smooth look after applying. If you want to try the next “IT” product I think you will be happy with Natura Veda with Moringa. The products are available at www.Moringasource.com The also offer the Moringa supplement for internal benefits. I had the opportunity to try out products from the company Dermagist recently. 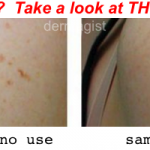 I chose to try out the skin tone correcting system that helps with dark spots. On the website it says that the products are natural and free of harsh chemicals. I have tried many products that are supposed to decrease brown spots and some worked a little and some not at all so I was curious to try these out. I know a lot of new moms have a problem with melasma from pregnancy and these products help with this. These products are a 2 step treatment. 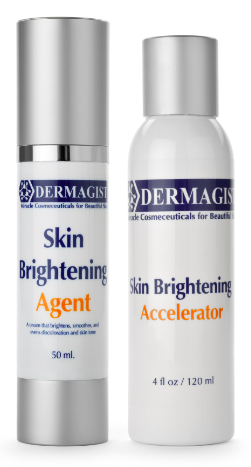 First there is a Skin Brightening Treatment and the second step is a Skin Brightening Accelerator. I used it for a few weeks and I did notice an improvement. I think with continued use I would probably see more. Another plus is that the Skin Tone Correcting System® has age-defying peptides that can help you improve the look of wrinkles and lines. I’m going to continue to use the products. On the website there are several pictures of before and afters that are really impressive. Below are some. 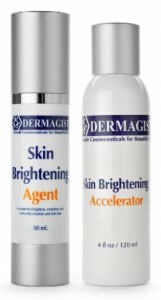 Dermagist also offers products for acne, many anti aging products and body products. Considering the products are natural I think the acne products would be good for teenagers and young adults. Check out the website for more info and special offers. 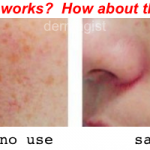 The products are 100% guaranteed.